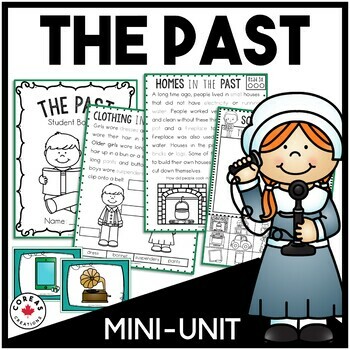 Easily teach your primary students about life in the past with this no-fluff Social Studies mini-unit. 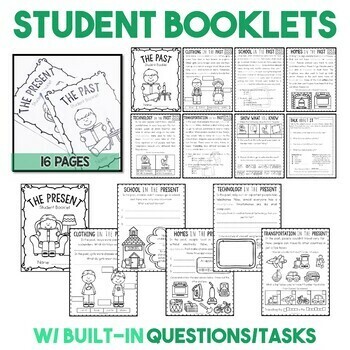 Informative student booklets, engaging review activities and hands-on/digital sorts are sure to delight your students! Comparing the past and the present has never been easier. Click here if you teach Grade One in Alberta, Canada. 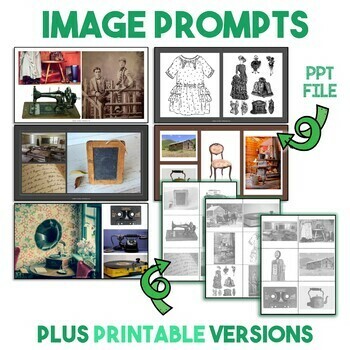 Three pages of writing prompts - would you rather live in the past? → Boom Cards are cloud-based digital resources. → Boom Cards play on modern browsers (released in the last three years). Free player apps are also available. 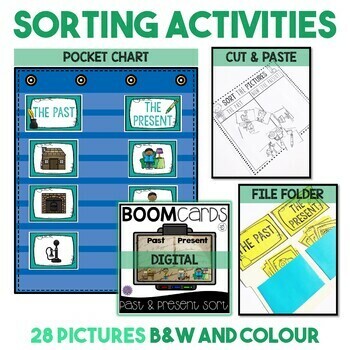 → To use Boom Cards, YOU MUST CREATE AN ACCOUNT through Boom Learning. There are free and premium memberships. → Click the links inside the product file to redeem your Boom Cards and create an account (or add to your account if you already have one). If you are new to Boom Learning, you will receive a 90-day FREE premium upgrade that includes student progress reports for up to 150 students. At the end of the trial period, you will be invited to purchase the upgrade. If you do not, you will be moved to a free account. You may upgrade, downgrade or cancel at any time. If you do not upgrade, you can continue using your purchased Boom Cards. Don't forget to follow my store for more great products for Canadian teachers!